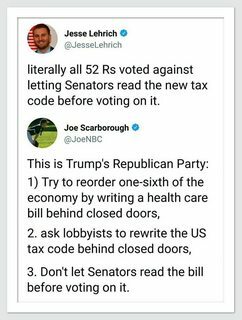 literally all 52Rs voted against letting Senators read the new tax code before voting on it. But I have yet to see any news articles describing this proposal (to delay the vote so senators may read the 407 page bill) or the described vote (52 - 48) despite numerous google searches. Did the alleged proposal or vote occur? The claim refers to the fact that the 500-page tax bill was given to the senators immediately before the vote. Democratic minority leader Chuck Schumer moved to adjourn, to give senators the weekend to read the bill. Mr. President, I move that the Senate adjourn until Monday, December 4, 2017, at 12 noon, and I ask for the yeas and nays. The vote was defeated along party lines [h/t: @daniel]. While the claim that NO senators had read the bill before voting on it can not be confirmed with certainty, the claim "All Republican senators voted against the motion to adjourn" is true, as confirmed by the official records of the US Congress. Not the answer you're looking for? Browse other questions tagged united-states politics government .